KATHMANDU, Aug 27: A rafting program was organized alongside the Hatyamochan Ghat to Guheshwari Temple of the Bagmati River on the occasion of 172nd week of Bagmati River Clean-up Campaign. 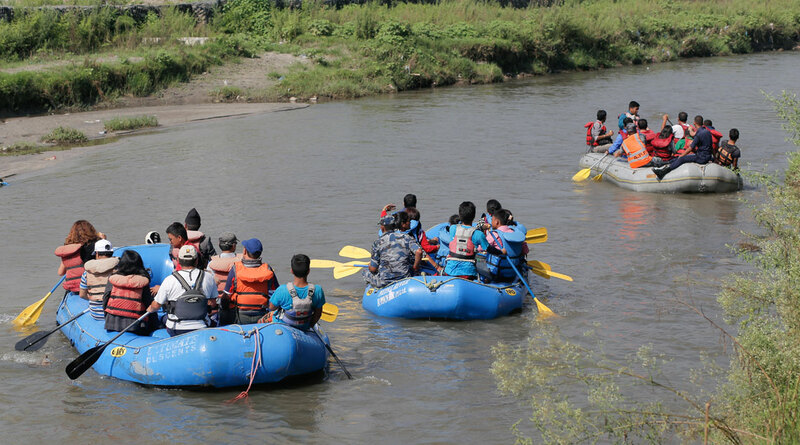 A total of 170 persons, including parliamentarians, heads of the various diplomatic missions in Kathmandu, high-ranking officials of Nepal Police and Nepal Army in 21 boats enjoyed the rafting stretching 3.5 kilometers. Various local communities, including Pudasaini Maitri Samaj, have been joining this social cause to help putrid Bagmati River regain its chastity and purity under the Campaign spearheaded by former Chief Secretary Leelamani Poudel since May 18, 2013. This is the 16th edition of rafting program organized by the Samaj under its 133th series of Bagamti Cleaning Campaign.